Contributed by Sharon Butler / When Jane Swavely isn’t working in the old-school LES loft where she raised two sons, she is at a cabin in the Catskills or sailing around the northeast on a beautiful, sturdy sailboat that her husband built. The last time we met was on Cuttyhunk Island off the coast of Massachusetts, where she had sailed from Martha’s Vineyard, braving nearly gale force winds, to attend a lecture I was giving at a small painting residency program. The next day, she sailed off in the fog, bound for the city and back to her studio. On the occasion of her glowing solo show, her fourth at A.I.R. 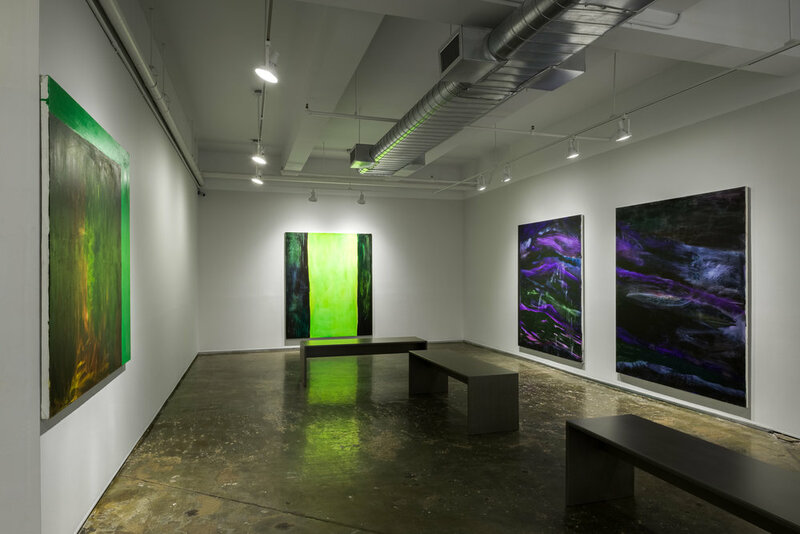 Gallery in DUMBO, I caught up with Jane to discuss the new paintings, futuristic landscape, contemporary anxiety, the joy of mixing color, and the illusion of light. Sharon Butler: Your work has changed quite a bit since your 2016 show. The old paintings seemed much more comforting and romantic, perhaps nostalgic for a different era, whereas these seem more nervous – anxious and on edge. Jane Swavely: Yes, I’ve been thinking more about the present and the future than the past. 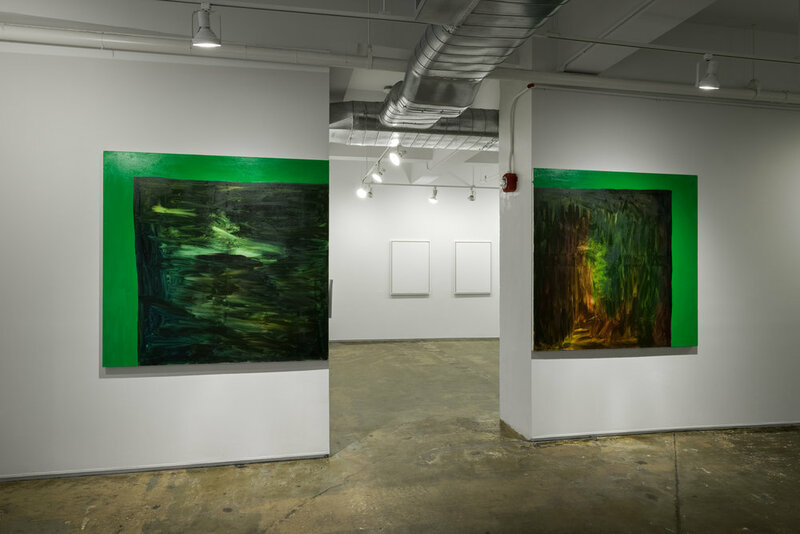 When A.I.R.’s Associate Director Patti Hernandez came to my studio last spring, she talked about my paintings as a kind of ‘futuristic landscape” that was apocalyptic and nihilistic. I’m not a conceptual painter – I start painting and think about it afterwards – but this seemed like an important conversation. The paintings start with a vague interest in mixing colors. I have a very traditional figurative background, and so that’s my vocabulary. Yet I have spent time in the landscape of the Catskills in the Hudson Valley and on the water, so that the quiet mysteries of nature – fog, wind, light, dark woods – do seep in. But that’s not the only external influence . For my last painting, Jinx, I was drawn to images online and on Instagram that had bright neon colors, and tried to figure out how to get that brightness in oil paint. I wanted to make the light appear to come from within the painting, so I mixed cadmium lemon and phthalo green, and then burnished it until it glowed. It’s impossible to photograph. I am always visiting galleries and museums, of course, but I love Instagram way too much. Jane Swavley, installation view at A.I.R. Gallery. SB: That green looks toxic – like poison. This one is quite different, more opaque than the others. SB: The paintings are having an interesting conversation about light. The light pops. But there is some fascinating brushwork as well. JS: Yes. The color mixtures are what interest me. That’s what gets me started on the paintings. But in the process, the paint application becomes kind of performative. I paint the canvases on the floor, crawling around the edges, on my hands and knees, slathering paint on with my hands and taking it off with white cotton rags. I go through boxes and boxes of them. In terms of materials, these paintings are much thinner and less finished and pristine than previous work; they’re dirtier. I’m not fussy about the surfaces. I didn’t want to overwork the paintings, and didn’t care if they got sloppy. Even so, an artist who came in earlier in the week suggested that the images looked cropped, and I think that’s true because there is a certain screen quality, like a computer, to these paintings, in terms of the light and the opaque framing devices around the landscape-like elements. SB: The responses to your new work have been good. What do you think about the installation? The way the paintings are hung on the south wall, framing the doorway, it’s like walking through a painting. The artist’s paintings in the next room are white, so it creates a dream-like scenario. If those paintings had been more lively or colorful, the package wouldn’t have worked. And the arrangement of the benches makes a path to the far painting, but also keeps the viewer from getting too close. 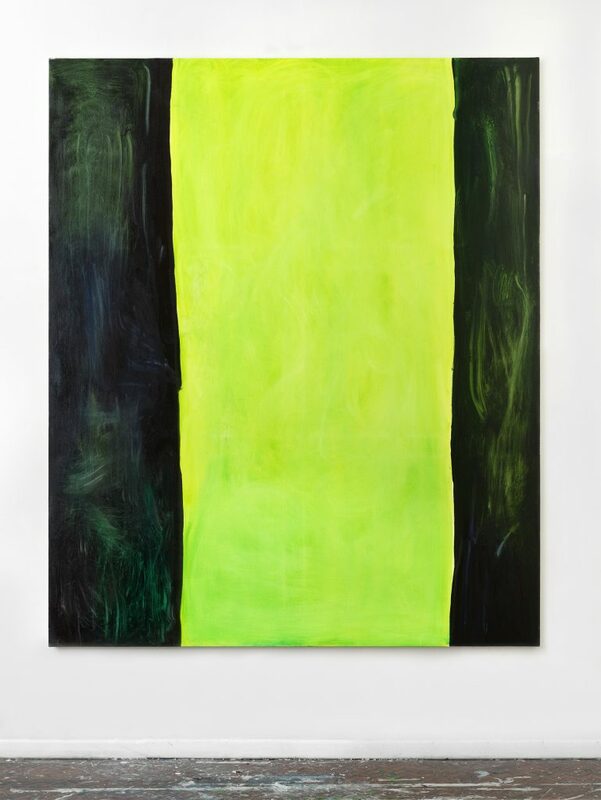 The acid green of the far painting on the east wall affects all the color in the room, reflecting off every surface. The experience is remarkable. JS: I got lucky. It wasn’t planned in advance. Our Executive Director Roxana Fabius and Patti set up the show and I was completely surprised and pleased. I just went with it. We kept the installation fairly spare because each painting is so saturated and needs a lot of room. The more you look at the paintings the more you understand them. Because of how the work unfolds over time, we thought that the benches would encourage people to spend time with it, just looking, and they have proven to be an important part of the installation. On account of the gallery lights, the paintings do look very different out of the studio – more robust, almost like completely new paintings. SB: They both exude and reflect light, especially because of the metallic paint that you use for under painting the smaller ones. Tell me about the titles – Jinx, for instance. JS: This past summer an artist performer and I coincidentally posted green screens on Instagram at the same time, and she commented ‘Jinx!” It happened a few times, and I liked the playfulness of the sentiment, but also the negative, superstitious connotation of bad luck. In fact, I liked it so much, I used it for the title of the show. The other titles are pretty spur-of-the-moment. Some paintings are just plain untitled, others nominally untitled but classified to sound a bit like chemicals. For instance, the purple ones are called Untitled Aa and Untitled Bb. I don’t like forcing a narrative by coming up with a detailed title, and I’m not too interested in narrative in general. I’d rather leave a painting open to interpretation. Sometimes people see small figures in them, and that’s not what I intended, but it’s OK. I am happy when people bring their own experiences to the work. SB: You know, I don’t think many galleries are showing gestural abstractions these days. JS: It never occurred to me, but maybe you’re right. A lot of what I see are paintings that are narrative or figurative, or maybe geometric abstraction. 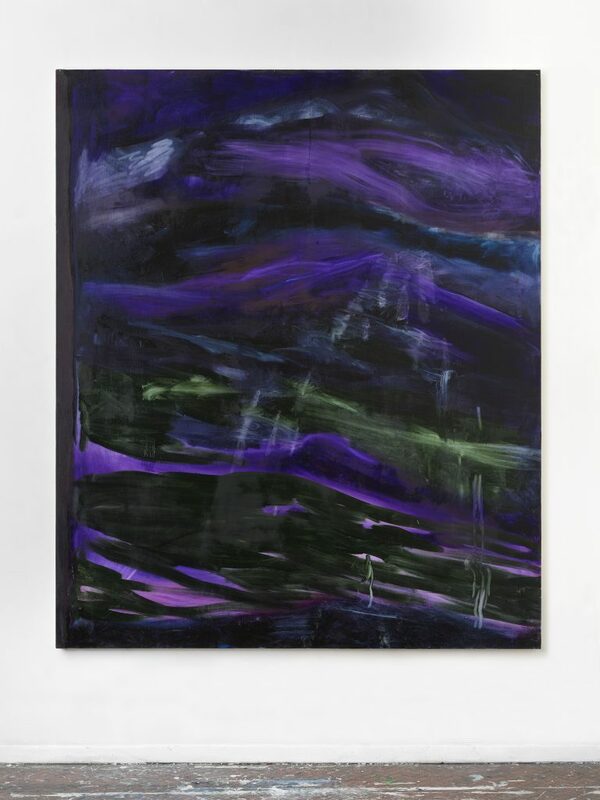 I’m interested in making space, and these paintings may be landscape-based, but they are definitely abstractions. I went for broke, and everything I’ve been trying has finally come together. I feel like, now, in my fifties, I’m making mature work. At last it has snapped into focus. I’m not interested in looking at my old work any more, I just want to keep moving forward. I’m always anxious about getting back in the studio, even after an absence of just a few days, but I think it’s important to keep going. SB: You have taken an important leadership role in A.I.R., which, according to the web site, “was established in 1972 as the first not-for-profit, artist-directed and maintained gallery for women artists in the United States.” The gallery helps younger artists find their way with the fellowship program and continues to promote mid-career artists as well. JS: I’ve been a member for almost eight years, and president of the board for the past five years. The gallery that represented me had closed and A.I.R. members Joan Snitzer and Susan Bee suggested I apply. It has been a wonderful experience. Our community is constantly evolving. We have artists ranging in age from the early 30s to nearly 80 years old, and the membership is becoming more diverse all the time. One of the things that attracted me was the fellowship program. And it’s nice to have a beautiful space to show work with no commercial pressure. Even if you aren’t selling work, you can still show consistently. Did you hear that A.I.R. is going to NADA in Miami this year? We got a grant to do a feminist library at the gallery, so we will be promoting that project at the fair, showing member artists’ books. SB: It’s terrific to see so much new energy and so many intriguing creative initiatives at A.I.R. I know your contribution is very much appreciated in the art community. Congratulations on your show, and thank you for everything you do. This exhibition is a treat. It reminds us of the liberation and excitement that gestural abstraction brought to the visual arts in the hands of American artists after the 1950’s and until now. 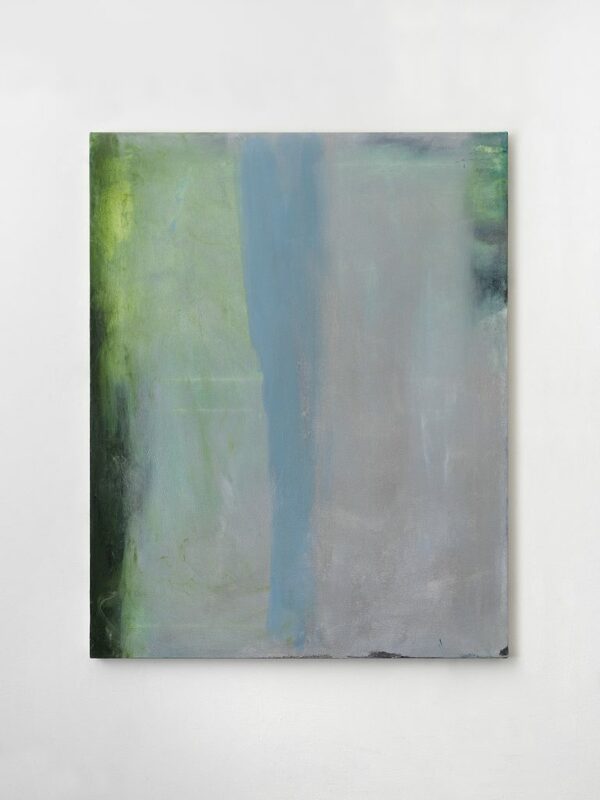 Swavely takes chances with raw chords of color that surprise and jar us to look and look again. 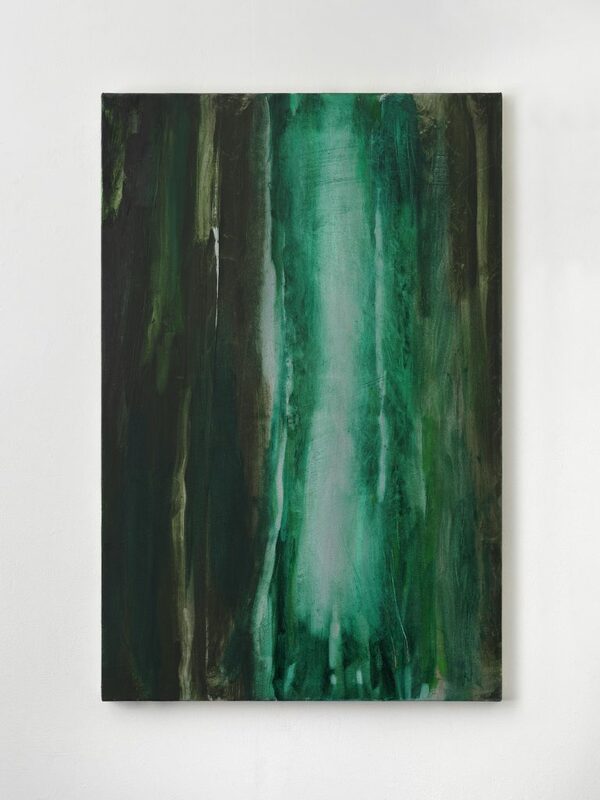 The “Green Screen” diptych hovers between brutal and beguiling. “Jinx ” is just drop-dead beautiful. The benches are a reminder that sophisticated color is a fickle companion and needs more than a glance to be fully apprehended. Like the paintings of Brice Marden or Mark Rothko, a few extract minutes will alter the impression, and is time well spent.